Enter a house deep in Lebanon’s Chouf Mountains, in sight of the storied cedars of Lebanon. Your host may welcome you to sit in the elegant living room and bring out a platter of figs, nuts, and cookies. Sitting beside these snacks will very likely be neither tea nor coffee, but a mug of yerba mate, an herbal infusion held as a national drink and icon of Argentina, Paraguay and Uruguay. In a television interview, soldiers in the Syrian military lead the cameraperson through the shell of a crumbling building and proudly show off their cups of yerba mate, which they then raise in a toast as gunshots are heard in the background. 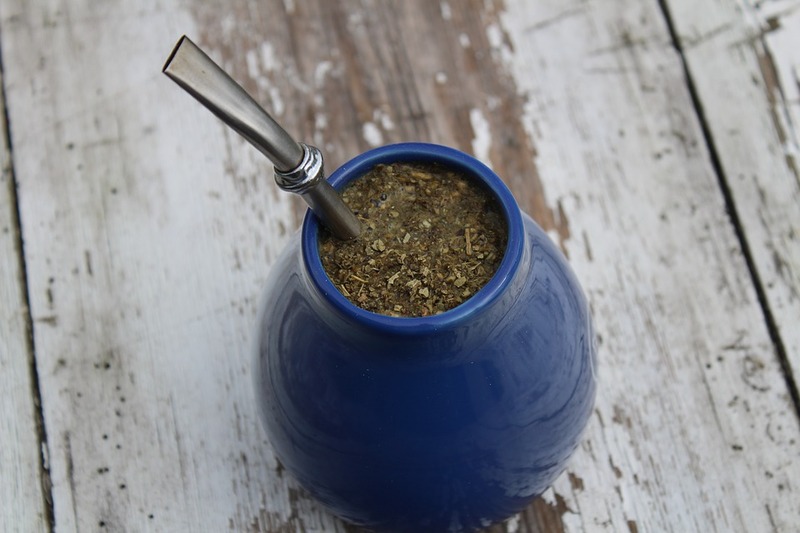 Yerba mate, or just mate (pronounced mah-tay), is a hot, slightly bitter, and grassy-tasting drink made with the leaves and stems of an evergreen bush native to the tropical lowlands of Paraguay. Rich in vitamins and just the right amount of caffeine, it is reputed to assuage many ills and keep a body energized but mellow. It is a social drink, shared with friends and family out of the same mug. Dried leaves are infused with hot water in the mug–usually a hollow, ornamented gourd (cuia)–and then drunk through a silver filter straw (bombilla in Spanish, masassa in Arabic). Until the Spanish colonization of the South American region in the 1500s, mate was enjoyed exclusively by the indigenous Guaraní and Tupí people of Paraguay. Today, of all the countries in the world, it is Syria that imports the most mate. Were Lebanon more populous, it would rival its neighbor for the title. Mate’s stardom in the Levant is more than just a random phenomenon. The reason that an olive farmer in the Lebanese mountains and a cowboy in the Argentinian plains could easily bond over a mug of mate is explained by a 160-year long story of political tumult, migration, and the relentless advance of globalization. 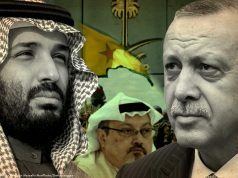 The story is shaped by, among much else, warring neighbors, unscrupulous ship captains and the fall of the Ottoman Empire. The Levantine love of mate stands as a symbol, a product of a rich and undersung branch of history of a relatively small group of people with an outsized impact on the world. Unbeknownst to many, Latin America is home to the largest Arab population outside of the Middle East, with estimates ranging from 17 to 30 million people. Brazil alone is home to at least 7 million people of Arab descent. The vast majority of these Arab Latinos have roots in Syria, Lebanon and Palestine, but are nonetheless broadly labelled as “Turcos,” or “Turks.” Today, it would be a major faux pas to call a Syrian Turkish, but the label, as erroneous as it is, makes sense. When Levantines began arriving in South America in the 1860s, Syria, Lebanon and Palestine did not exist as sovereign nations, but as a part of the Turkish Ottoman Empire. Around that time, the story goes, Dom Pedro II, the last Emperor of Brazil, reputedly travelled to the Levant in the 1870s and was so impressed with the local culture that he offered to welcome Christian Lebanese immigrants to settle in southern Brazil. What is more certain, however, is that in 1860 a brutal civil war between the local Maronite Christians and their Druze governors rocked the mountainous region of modern Lebanon, leaving nearly 20,000 Christians dead. War pushed some to flee the region and head to the coast or across the Atlantic Ocean. The peace that followed brought medical advances, schools and an economic uptick that spurred a demographic boom in the area, known as Mount Lebanon. The bubble eventually burst, driving migration from the overpopulated mountains to Beirut, whose population had already quadrupled in the previous few decades. Between 1860 and 1914, an estimated 45 percent of Mount Lebanon’s population emigrated out of the region. Meanwhile, the Ottomans established the Mutasarrifate, a new political authority in Mount Lebanon that forced the mountain communities into the global marketplace. European goods and a market-based economic system made inroads in the Levant, eroding Mount Lebanon’s diversified, community-based economies. A boom in monoculture silk production brought Mount Lebanon fleeting profits, but competing Chinese silk soon brought a crash and left the region with major losses and major motivation to find work elsewhere. The globalizing, industrializing economies of the late 1800s began to absorb people half a world away from each other into the same sphere. The world opened up in a way it never had before. Oscillating economic opportunities in the Levant and South America molded the ebb and flow of people between the regions. Rich with resources but short on labor to exploit them, South America was a new frontier for international capitalists and the workers they relied on. In the 1890s, the rubber industry boomed in Brazil’s Amazon, drawing laborers from places as far apart as Morocco and Japan. Among them were North African Sephardi Jews, Brazil’s first immigrants from the MENA region. Soon after followed workers from Lebanon and Syria (who the Brazilians referred to as “Jews”). The prominence of the Lebanese coast grew in tandem with the woes of Mount Lebanon. Emigrants from the mountains travelled to coastal ports like Beirut and Tripoli, which were now linked to Europe and the Americas via regular steamship lines. Beirut swelled, but with too many people came too few jobs. Unemployment advanced emigration overseas. Jobless Lebanese went to the Americas and some came back, carrying back wealth and success stories, encouraging others to make the long journey across the Atlantic. Around 80,000 Syrians and Lebanese arrived in Brazil between 1870 and 1947 (an average of around 1,040 per year). More, however, landed in the U.S. and Argentina. In every year between 1880 and 1914, “at least 1,500-2,000 newcomer [Arab] immigrants settled down in Argentina,” reported historian György Kukovecz. The journey was expensive. Some migrants had to sell many of their belongings to cover the high costs of a passport and passage across the ocean. Shipowners worked as agents of industrialists in the Americas, recruiting cheap labor from overseas. This network loaned some of the poorest migrants travel expenses on high-interest credit, which often landed laborers in exploitative debt traps when they arrived. Some of the Levantine immigrants to South America arrived there unintentionally. Shipping companies conned hopeful U.S. immigrants by offering passage to “America” and transported them to Latin American ports like Rio de Janeiro, Buenos Aires, Veracruz, and Santos instead. Unable to afford passage elsewhere, they settled in, adapted quickly and made it work. The pull to leave Lebanon in the early 20th century was not simply a mechanistic result of global labor markets. In the 19th century, European missionary schools and successful, homecoming emigrants brought an “Occidental orientation,” in the words of scholar Eliane Fersan. 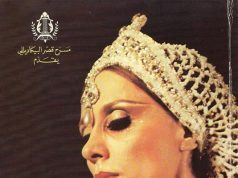 Lebanon adopted European lifestyles and aesthetics that attracted local youth across the Mediterranean and the Atlantic. The prospect of freedom of speech in the Americas drew others who started Arabic magazines and papers concerning the life and politics back in the Levant. As money pulled people to South America, conflict pushed others away from the Middle East. 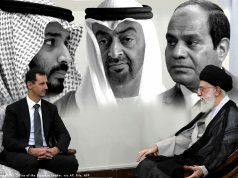 A series of armed conflicts embroiled the Levant from the 19th century onwards: the Druze rebellion against the Ottomans in 1909, the Italo-Turkish War of 1912, World War I and the ensuing collapse of the Ottoman Empire, the Franco-Syrian War in 1920, the Great Syrian Revolt, World War II, the Arab-Israeli War in 1948, and the Lebanese Civil War in 1958. With every conflict, groups of Lebanese, Syrians and Palestinians fled to safer territory — other Arab countries, Europe, the U.S., and, increasingly, South America. Persecution by the Ottoman rulers pushed more to flee. In the years between the Druze rebellion in 1909 and the Italo-Turkish War of 1913, 46,000 Levantines arrived in Argentina. Others fled from being put on the frontlines. At the turn of the century, the Ottoman Empire instituted obligatory military service that targeted Christians, many of whom, along with local Jews, emigrated to avoid conscription. During World War II, more Syrians and Lebanese fled conscription into the occupying French Army. World War I was a powerful catalyst. Faced with an Allied blockade of the Syrian coast during the war, Ottoman authorities requisitioned most food supplies to feed the military, leading to a brutal famine that killed upwards of half a million Levantines. Many fled to the Americas. In the wake of the war, the Ottoman Empire collapsed, and European powers divvied up the region into Syrian, Lebanese and Palestinian states. The definitions of these modern states would come to shape the political landscape of the Levant for the next century. Fersan explains that migration from the Levant to South America slowed dramatically immediately after World War I. In the 1920s, the French established mandatory rule over Syria and Lebanon, bringing a measure of stability. At the same time, the U.S. established limiting immigration quotas and the Great Depression cut opportunities across the globe. Although emigration slowed again after Lebanon’s independence in 1948, the following decades of domestic and foreign political turmoil sent more Levantines across the Atlantic. The Arab-Israeli Wars in the ‘40s and ‘60s, in particular, proved significant incentives to leave and start anew overseas. Instability impelled 164,000 Lebanese to flee between 1973 and 1974 alone, although most did not land in South America, whose economies were in decline. The global landscape had shifted, pulling young students to North America and Europe and job-seekers to the Arabian Gulf oil boom. Before it ended in 1990, the brutal 15-year Lebanese Civil War pushed nearly one million Lebanese–around 40 percent of the population–abroad. The 1983 terrorist attacks in Beirut engendered fear of Lebanon, hampered visa processes and led war refugees, who had intended to be abroad temporarily, to seek citizenship in their host countries. Today, it is mostly highly-educated Lebanese who are emigrating to work abroad. Over the course of this 160-year intercontinental drama, the Syrian and Lebanese immigrants who landed in South America settled into the local social landscape quite well and made a striking impact on the continent. Those who returned to the Levant brought with them the trappings of their adopted homes–among them was yerba mate. Returning Levantines carried yerba mate and its culture to Syria, to Lebanon, and then to parts of northern Palestine, which Israel occupied in 1967. Syria imports between 15,000 and 24,000 tons of mate per year. Most is Argentinian–Syrians drink around two-thirds of Argentina’s total yearly mate exports. Jabal al-Druze in southern Syria and the Chouf Mountains of Lebanon are the regions most thoroughly steeped in yerba mate. They are also home to the Druze. Mate holds particular importance for the Druze, a secretive and insular ethno-religious group with communities in the mountains of Lebanon, Syria, and Israel. When one enters a Druze household, the host offers mate as a welcome. The violent anti-Druze policies of Syrian President Adib Shishakli propelled Druze emigration in the 1950s (Druze leaders soon overthrew Shishakli and forced him to flee to Brazil, where he was eventually assassinated by a young Druze). Many made their way to Argentina, Brazil and Uruguay, where the Levantine communities were less sectarian than back home. Though the Druze often warred with Maronite Christians in Mount Lebanon, they lived beside them in South America. Druze associations exist today from Argentina to Venezuela. One Lebanese mate lover opened a restaurant called The Mate Factory in the mountain town of Aley and imports several tons of mate every year. Syrians can buy yerba mate from vendors on the beach or in any store that sells coffee and tea. One London-based Syrian fills her luggage with mate before visiting home. Even Dubai has its own yerba mate store. Yerba mate has ingrained itself so deeply in Syria and Lebanon that some Levantines believe that the drink actually originates in the Middle East. For mate to become so assimilated into the Levant, Levantines first had to become assimilated into South America.